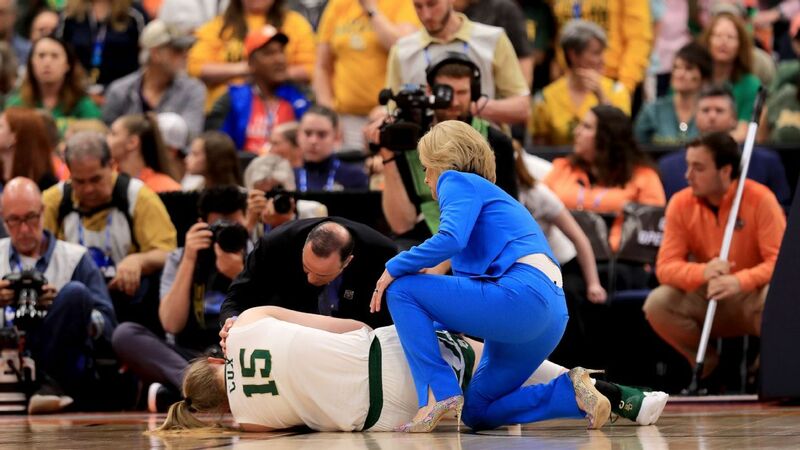 1; Baylor junior forward Lauren Cox injured left leg in the third quarter of the women's basketball national championship game with Notre Dame and had to leave the court in a wheelchair. Cox was injured under Notre Dame's basket with 1:22 left in the third quarter and Baylor leading 62-50. She had eight points, eight rebounds and two assists when she left the game. Baylor scored 25 points on 11-of-14 field goals when Cox got a touch at the free-throw line, according to ESPN Stats & Information. Cox returned to the Baylor bench on the record with a brace on her knee with 4:55 left in the game and the score 74-74. Cox had 21 points, 11 rebounds and seven assists in Baylor's 72-67 semifinal victory over Oregon on Friday.